How to Rip DVD to MP4 for iPhone iPad Android with WinX Free DVD to MP4 Ripper? Use WinX Free DVD to MP4 Ripper! MP4, officially MPEG-4 Part 14, is a media container format developed by ISO in 2003, which always ends with .mp4, containing video, audio, subtitles and still images, but is definitely not the same thing as MPEG-4/H.264 codec. Out of its cutting-edge data compression algorithm and more specifically better quality in smaller file size, MP4 has grown in popularity all these years and becomes the first video format option for most people. Boasting of high compatibility and great quality, MP4 is reckoned as the most preferred choice for video playback, online sharing and streaming. You can feel free to play MP4 with your smartphones, tablets, TVs, game consoles (Xbox, PlayStation), etc on bus, subway or on the road; upload and share MP4 videos on SNS (YouTube, Facebook, Instagram etc.) limitlessly; or live stream videos in MP4 by taking up little bandwidth easily. Obviously, they all come to the same conclusion: if you want or have to rip a DVD disc, rip DVD to MP4 format for free! How to Rip DVD to MP4 on Windows (10) in Free Way? Clean and wholehearted WinX Free DVD to MP4 Ripper is definitely a good bet for converting DVD to MP4 free on Windows (XP/7/8/10) PC. When you are done, the DVD video in MP4 can be enjoyed on nearly all media players, be them iOS/Android mobiles, HDTVs or gaming consoles. Free download WinX Free DVD to MP4 Ripper (.exe) and install it on your PC following the setup wizard. Run the software, and click "DVD Disc" to load source DVD content. (ISO/video folder are accepted as well). There pops up a "Output Profile" dialog box, select PC Video -> MP4 Video (MPEG4) -> click "OK" to go ahead. MP4 settings (optional): "Browse" to set a specified folder for saving files. Or click "Setting" icon to personalize your video by adjusting resolution, frame rate and aspect ratio. Press "RUN" to begin the free DVD to MP4 ripping. And a small process window will present the ripping speed and time in details. There are dozens of free DVD ripping tools out there, such as HandBrake, DVD Shrink, Format Factory, or even VLC player, which also allows DVD conversion. However, do a test of them all and you will see that WinX Free DVD to MP4 Ripper wins for reasons, like more input sources, support of wider range of output formats, faster DVD ripping speed, and more importantly to some, the ability to bypass copy protections. HandBrake would be the first that comes to people's mind when free ripping DVD to MP4. And that's no problem if you are dealing with a homemade DVD or CSS protected disc. DVD Shrink rips some encrypted DVDs, but does not support MP4 as an output format. Format Factory and VLC, based on our test, do rip DVD to MP4 for free, however extremely slowly. * No output file at all, whether in its default path or our rearranged one. Output an .mp4 file with no content and not playable. No.1 fast freeware to rip/copy DVD into MP4 or others! Read the review of top 5 best free DVD rippers/copiers: WinX DVD Ripper, HandBrake, MakeMKV, DVD Shrink and Freemake Video Converter for Windows 10/8/7 and Mac. How to free rip/copy DVD to hard drive Windows 7/8/10? This article will introduce the easiest solution to rip transfer/backup DVD to hard drive with the best free WinX DVD Ripper. 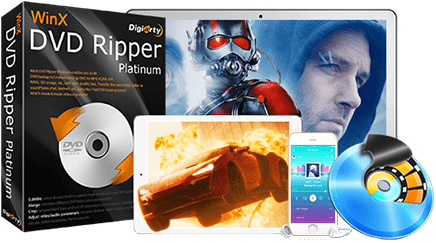 WinX DVD Ripper helps you free rip DVD to USB/USB Type-c flash drive, free transfer DVD to USB 3.1/3.0/2.0 flash drive, or free convert DVD to MP4, MPEG, MOV, WMV, etc for storing on a USB drive. ● No.1 fast DVD ripping software in the world. ● Rip DVDs to AVI, MP4, MPEG, MOV, FLV, etc. ● Convert DVDs to iPhone, iPad and Android. ● Merge, crop, trim and add SRT subtitle.